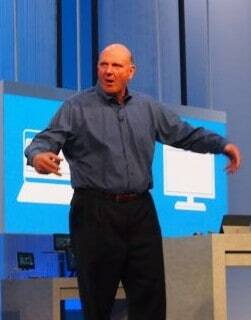 On Wall Street, they’re giving Microsoft CEO Steve Ballmer the bum’s rush. Ballmer has just announced he’ll soon retire. After his announcement, Microsoft’s shares shot up 7 percent. The wise guys on Wall Street obviously can’t wait to see Ballmer go. And neither can business pundits. Ballmer’s 13 years at Microsoft’s summit, they seem to agree, have been a huge disappointment. Plenty of evidence certainly does exist to back up that appraisal. Microsoft, once a high-tech pacesetter, has become a second-tier presence in the hot new frontiers of mobile and cloud computing. Microsoft’s share price, under Ballmer’s watch, has dropped by about a third. Meanwhile, Ballmer himself has done fabulously well. Since 2000, the value of his own personal Microsoft stock stash has jumped — after years of lavish executive rewards — by more than $3 billion. Few business observers believe Ballmer merits all these multiple billions. But Ballmer’s pals feel he’s performed just fine. After all, they note, Microsoft annual revenues have almost quadrupled on his watch. And that share price skid? Over the past 13 years, other computing giants have actually fared much worse than Microsoft. Cisco shares have slid 54 percent, Dell’s almost 70 percent. So what should we make of all this? Has Steve Ballmer performed well or poorly? Retiring CEO of Microsoft, Steve Ballmer. Sarah Anderson and her colleagues at the Institute for Policy Studies have been tracking this “performance” charade for the past 20 years. Over those years, the Institute’s annual Executive Excess reports have shown time and again that America’s CEOs owe their outrageous pay to outrageous behaviors, everything from downsizing to the deep-sixing of worker pensions. Corporate America, naturally, disagrees. 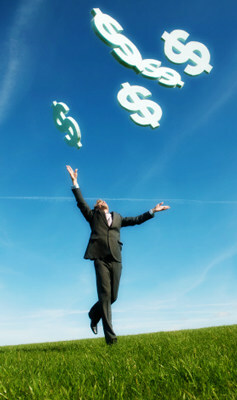 High executive pay, corporate leaders insist, simply reflects high performance. This year’s just-released 20th anniversary Executive Excess report puts this claim to the test —by measuring America’s top-paid CEOs of the past 20 years against a performance yardstick that even the most inventive corporate flack could never game. This performance yardstick starts with bankruptcy. CEOs who’ve led their companies into collapse — or only averted collapse because taxpayers bailed them out — have clearly performed poorly. So have CEOs who end up getting fired. And so, as well, have CEOs whose firms have had to shell out significant fraud-related fines and settlements. How many of America’s most highly paid CEOs of the past 20 years rate as “poor performers” by this no-frills Executive Excess yardstick? Institute for Policy Studies analysts have done the calculations, taking the Wall Street Journal’s annual lists of America’s 25 most highly paid CEOs as their prime data source. An even higher share of highly paid CEOs — 100 percent — has enjoyed an annual subsidy from America’s taxpayers. The more corporations pay their CEOs, under current law, the more they can deduct off their corporate taxes. Executive Excess 2013 highlights the pending legislation that would undo this massive corporate tax break — and also lists a number of other promising steps that could help rein in CEO pay excess. Congress could, for instance, deny federal contracts to firms that pay their CEOs over 25 or 50 times worker pay. Back in the 1960s, hardly any American corporate CEOs took home more than 50 times what typical workers made. 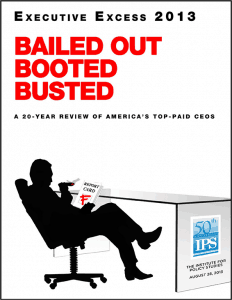 By 1993, CEOs were averaging 195 times worker pay. The current average differential: 354 times.